Editor's note: The Maitra Lecture is sold out but will be streamed live online at http://www.ustream.tv/channel/xFfqWFuFgVB. 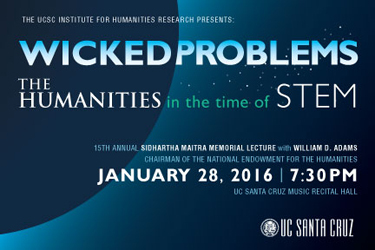 The Institute for Humanities Research at UC Santa Cruz will present the 15th annual Sidhartha Maitra Memorial Lecture--featuring alumnus William “Bro” Adams, chairman of the National Endowment for the Humanities--on Thursday, January 28, at 7:30 p.m. in the Music Center Recital Hall. As the National Endowment for the Humanities is now celebrating its first 50 years, Adams will share his thoughts on the next 50 years of humanities scholarship and education in an age focused on science, technology, engineering and mathematics. Adams was nominated by President Barack Obama as the 10th Chairman of the NEH and confirmed by the Senate in July of 2014. Last year, he marked the official launch of the NEH initiative “The Common Good: The Humanities in the Public Square” with an address at the National Press Club in Washington, D.C. focused on the humanities in public life. He noted that since its founding, the NEH has made roughly 71,000 grants to individuals and organizations totaling approximately $5 billion and leveraging an additional $2.4 billion in private philanthropy. Adams added that the NEH would be launching an effort to encourage humanities scholars to focus on topics that are relevant to Americans’ daily lives, using grants and new projects to emphasize the link between the humanities and public life. A native of Birmingham, Michigan, and son of an auto industry executive, Adams earned his undergraduate degree in philosophy at Colorado College and a Ph.D. from UC Santa Cruz in the History of Consciousness Program. He studied in France as a Fulbright Scholar before beginning his career in higher education with appointments to teach political philosophy at Santa Clara University in California and the University of North Carolina at Chapel Hill. He went on to coordinate the Great Works in Western Culture program at Stanford University and to serve as vice president and secretary of Wesleyan University. 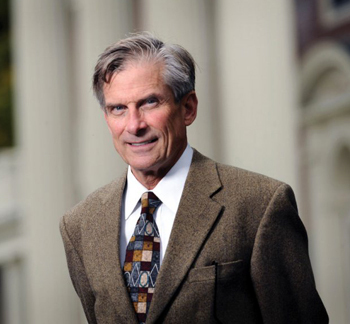 He became president of Bucknell University in 1995 and president of Colby College in 2000. Nicknamed Bro by his father in honor of a friend who died in World War II, Adams served in the Vietnam War as a First Lieutenant in the U.S. Army, and notes that experience helped motivate him to study and teach in the humanities. As senior president of the New England Small College Athletic Conference (NESCAC), Adams has been at the center of the national conversation on the cost and value of liberal arts education. Admission to the 2016 Sidhartha Maitra Memorial Lecture is free. Online reservations are closed. To be placed on the waiting list please email specialevents@ucsc.edu or call (831) 459-5003. This event is presented by the UC Santa Cruz Institute for Humanities Research.